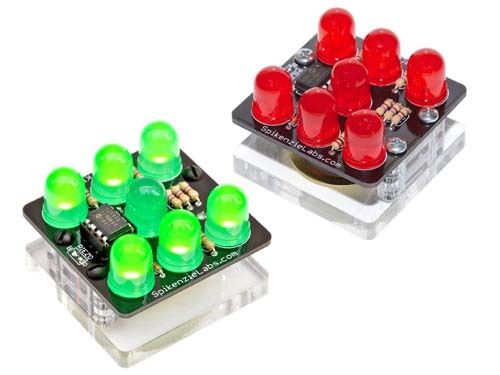 These electronic dice kits from Spikenzie Labs are perfect for beginners and come with everything you need to make your own ‘Electronic Die’. The name Dice kit sounds a great deal better than ‘Die Kit’, so they bent english grammar rules just a little in the name of making a marketable product. The die have a solid perspex base and large 10mm LEDs. The base has a piezo sensor on it so when you tap it down, it lights up showing a number between 1 and 6. After a short while, the die goes into sleep mode, until the next time it is tapped. It is available in two colours, green and red and at $24.00 they make make a great stocking filler for xmas. The video below shows you how to assemble it, with full details available at http://www.spikenzielabs.com/dice.